The Andhra Pradesh Government inked aN MoU with State Marine Technical University of St. Petersburg to promote marine education and technology at St. Petersburg today on the 5th day of the AP delegation's tour. The University works in close connection with United Shipbuilding Corporation and Rosoboronexport. 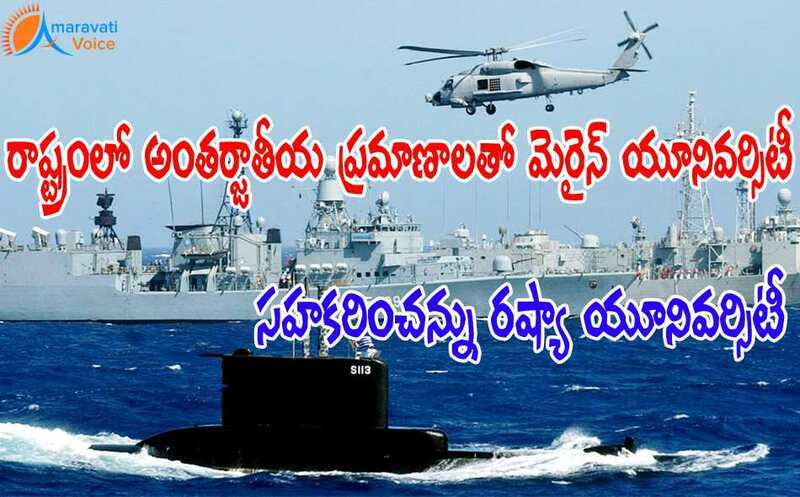 Companies involved in the marine segment in India and AP will benefit from this collaboration. Through a power point presentation, the University authorities highlighted their capabilities. They said 60 % of their graduates are employed by shipbuilding university. The University also has facilities for continuous upgrading of skills of shipbuilding professionals. It also concentrates on innovation and research in ship building and all aspects relating to the sea. Rakhmanov Alexey, President of United Shipbuilding Corporation said that the state university is considering to making AP the headquarters of the company in India since AP has unique marine activity. Highlighting the opportunities available, the Chief Minister said AP is set to become a logistics hub in India. “We want to promote inland navigation and also the commercial usage of water transport. Water-based transport is cheaper when compared to other forms of transport,” the CM said. Expressing happiness to associate with the Maritime University, the Chief Minister said that AP is planning to encourage marine education in a big way. “We will set up maritime university immediately. We have Hindustan Shipyard limited with excellent infrastructure,” the CM remarked. The university authorities added that they are opening new labs and centers of study within the university.